Everyone company wants traffic to their website, but generating traffic isn’t their main motto. The main goal is to convert the visitors into permanent customers. 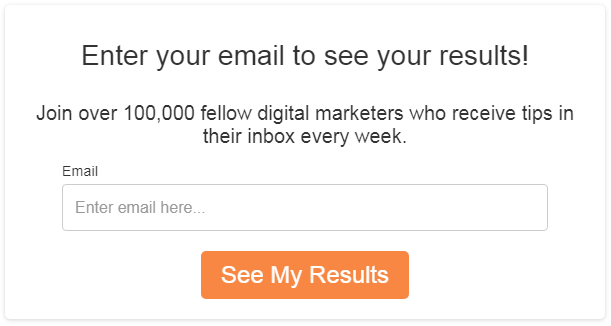 So, the point is to generate targeted as well as productive leads. This is where Lead Magnets come into play. Lead Magnets is not a new phenomenon. They are an essential way to generate leads and have been used for a while now. So, what exactly is a Lead Magnet? Lead Magnet is basically a catalyst that businesses use to lure in the leads. The companies ask their audience to enter their contact information and other personal information in exchange for a reward. And don’t commit the mistake of taking lead magnets lightly. For instance, Hubspot published over 130 lead magnets in 2017, which resulted in over 53,000 shares on Facebook, Twitter, and LinkedIn. The top ten of the lead magnets that they published accounted for about 77% of those shares. 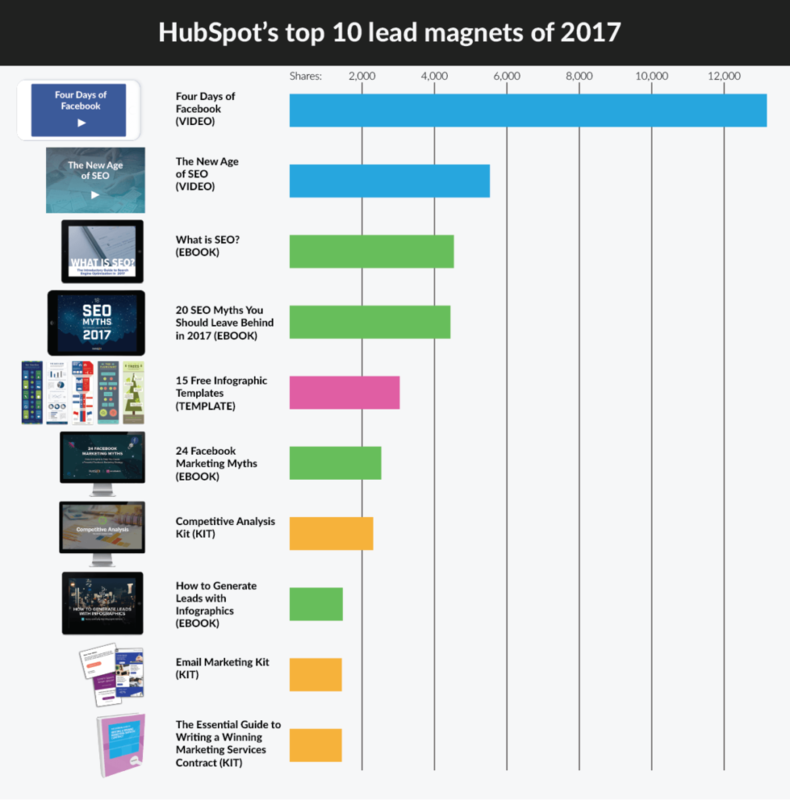 Here are the top ten lead magnets used by Hubspot. So, the success story of Hubspot clearly proves that one stands to acquire plenty of leads if one leverages lead magnets. Keeping this in mind, today, we will discuss 5 effective lead magnet ideas to grow your email list. Webinars are a great way of connecting with your prospects and leads and interacting with your existing customers. However, webinars can be used for different purposes as well. It can be particularly used as a lead magnet. For one, Webinars will help you impart valuable and knowledgable information that might turn out to be useful for your audience. The attendees can apply your tips to solve their problems. Secondly, you can also conclude your webinar with an offer like a discount coupon or any other incentive that will keep your audience invested in your content. This might eventually lead to a final purchase as well. 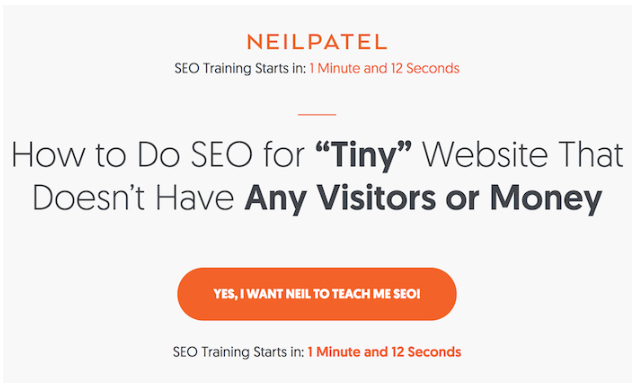 Neil Patel, a seasoned marketer whose name doesn’t even need an introduction, has done lots of webinars over the years. And he often states in his blog posts how much traffic he has accrued due to webinars. It is worthy to note that how he has made use of witty CTAs to attract the audience. 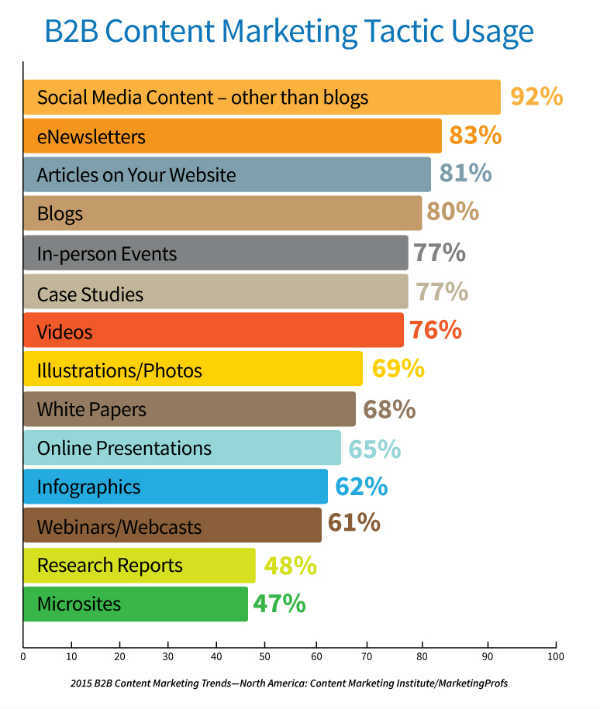 Moreover, according to a 2015 report, more than 60% of marketers are using webinars as part of their content marketing strategies. With everyone flocking to use Webinars, they sure are a great way to grow your email list. If you want your business to flourish by acquiring new, productive leads daily then we would recommend you to use Webinars as a lead magnet. One of the most common lead magnets that you can find online are ebooks which are closely followed by PDF Guides. Both PDF guides and ebooks are great because they allow you to elaborate your point which is somewhat difficult to do in a blog article. The best part is that you don’t need to splurge a lot of money to create either of them. However, if you choose the right topic that aligns the best with your target audience, both the tactics can get you plenty of visitors who will willingly enter their email address. Adam Connell, another famous copywriter, uses ebook guides as a lead magnet to grow his email list. However, don’t forget that your PDF guides and e-books should revolve around a specific topic. You should be able to solve at least one arena of your prospects pain-points with your guide, otherwise, there’s no point in publishing one. From Freemium models to offering free trials, companies use all sorts of baits to acquire leads and grow their email list. It’s ingrained in human psychology to get attracted to the products that have the word “free” written all over them. That’s why offering a free trial proves to be such an effective lead magnet. Moreover, a free trial helps the prospects become familiar with the product that might be skeptical to purchase right away. Freemium models are a part of the same Venn diagram as the Free trials. However, there’s one difference. While the period of free-trial is bound to expire, on the other hand, Freemium models offer limited services for free without any expiry date. I recently came across this very engaging free trial lead magnet that also included an eye-catching gif. So, your free-trial lead magnet doesn’t have to bland. You can bring more light to it by adding more character and personality to it. Whenever I come across a quiz or a survey after a blog article, I can’t help but participate in them. And who can blame me? Quizzes are super fun. 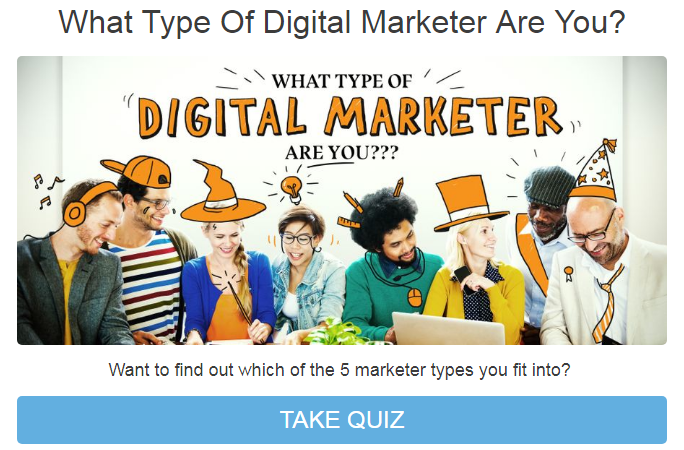 Therefore, using quizzes as lead magnets can actually prove to be very lucrative. Moreover, they don’t seem to be intrusive. So, it’s a win-win situation for you. You can ask questions and acquire important information from your visitors without coming across as too intrusive and annoying. And you know what the best part is? This attracts only the target audience, so the chances are that most qualified leads will end up participating in them. Once you completed this quiz, you will need to enter your email address to see your results. I am sure this subhead has you confused. Don’t worry, you will know in a minute. This is one of the best lead magnet ideas that I have come across. I was reading a blog article about sending an outreach email. The article talked about how the author successfully caught his prospect’s attention. This out-of-the-blue lead magnet was so perfect that I opted in without thinking twice. But the key is to write something so engrossing that automatically leads the viewer to want to read more. Lead Magnets surely are one of the most effective ways to acquire productive leads and grow your email list. The ways that we discussed can also help you to get a better insight into the minds of your prospective customers which might allow you to nurture your leads. And the best part is that you don’t need to be tech-savvy to use any of these lead magnets. You just need to be informed about the topics you are writing about. And what you lack in knowledge, you can also make up for in your research. So, what is your favorite lead magnet idea?